The dogs sometimes go off their food when traveling, meaning that all of a sudden, their most beloved dinner treat appears distasteful to them. Our boy Beckett would refuse to eat and start losing muscle tone. At times like this, an owner-handler such as myself will do anything to get the dog to eat. He decided that Mc Donald’s was delicious. Not Burger King. Mc Donald’s. This was easy, because we could always find the Golden Arches. He liked either Big Macs or Double Cheeseburgers. Subsequent show dogs all let us know what they “needed”, and we would comply. I know it sounds crazy, but we would be at a two to four day show and even missing one meal would alter how fit they looked. In the show ring, similarly, it is all about whatever-Fido-wants and sometimes it is food that gets them on their toes and looking their best to the judge. When you are in the ring, and you are facing stiff competition, such as at the Westminster Kennel Club show at Madison Square Garden, you do what you have to do. One dog might respond to a small squeaky toy, but to another its liver that attracts. That was my boy Beckett’s treat of choice. In his case, I cooked up pork liver (it is less crumbly than beef liver) and store pieces in my designer suit pocket until the exact moment in the ring when I most need my dog’s attention. If I’m offering it to the dog, and the judge comes by, I quickly slip it in my mouth and store it in my cheek. When you see the handlers on television stuffing things in their mouths, that’s what it is, the dog’s bait. This tactic also gets the dog to look at your face, which is often highly desirable as you can give them cues as to what you want them to do. Other dogs might like popcorn or even vanilla cream filled cookies. Or freeze-dried chicken hearts, lamb jerky or even gingersnaps. In other words, whatever rings your dog’s bells that’s what you keep at hand. And in your mouth. Don’t worry, I brush my teeth well. PS: my son Freeman is tucking bait into his pocket in the picture. He has much more decorum than I. 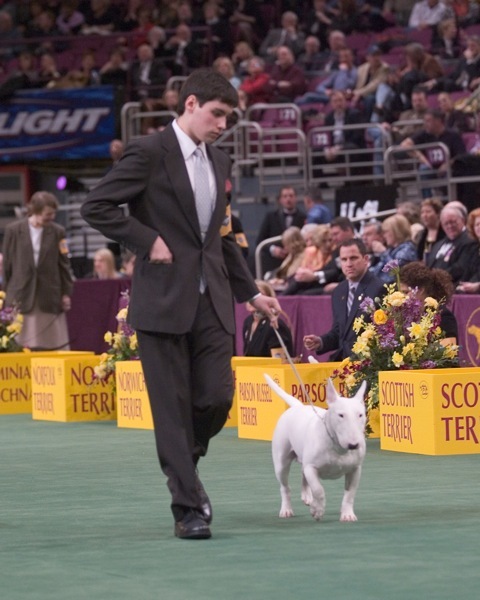 The image is from the televised Terrier Group at Madison Square Garden in 2006. He had just turned 16 years old and was in the ring with all the professional handlers. That is his dog Ch. Winsor’s Hope Springs Eternal ROM, aka Hope. RIP dear Hope, we all miss you.